In previous newsletters I've introduced you to our dog, Daisy, and I've shared with you how QuikPrep Applique came about. This month I want to introduce you to my husband. He is an integral part of my trunk shows/workshops. He has always supported me in my love of quilting but now he is involved. In preparation for our trips, he handles all of the campground arrangements and plans our route. He also helps fold and stuff patterns. He helps set up and take down the shows and occasionally even sells a pattern. 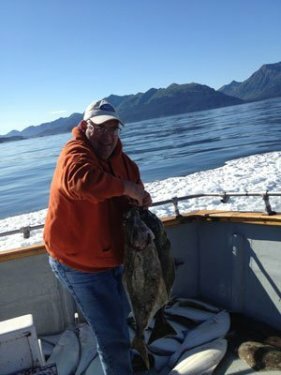 Jerry is halibut fishing off the Alaskan coast. 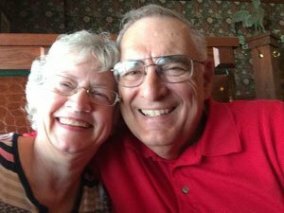 Jerry worked as a financial planner for Principal Financial Group for over 25 years. He has two major hobbies. He only gets to indulge in one of them once a year. That is fishing. The photo at the left was taken off the coast of Alaska when he went halibut fishing. He caught his limit. His second hobby is woodworking. He is a very talented craftsman. Nineteen years ago we built a new home. We didn't have the interior finished. We have done that ourselves, including all the kitchen cabinets. It is taking a long time - still isn't done - but he has had so much fun. (And by the way ladies, it doesn't hurt to have a husband with a hobby more expensive than quilting. He never complains when I haul the fabric home.) I'm one luck gal. Above is the bookcase Jerry built in our living room. 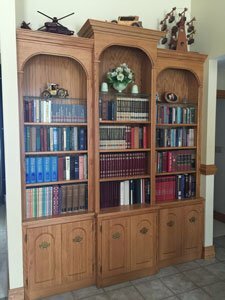 Below is a shelf he made around our breakfast nook. It is an octagon on five sides. Getting all those angles perfect was a challenge. It is these little extra touches that he has added to our home that makes it special to us. Above is my work area. In front is a 3' x 10' project table where I fold patterns and cut quilts. 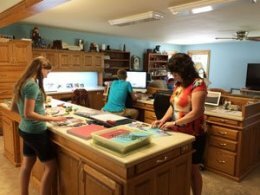 Our family is busy working on a scrapbook in the photo above. Behind the project table is a desk, also 10' long. 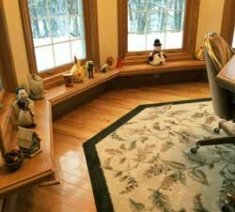 We each have our own work area with our own computer. The bright light in the back left is over my sewing area. My sewing machine is tucked away at the moment but it is always very close by. Embroidery can add so much to our applique. The beehive at the right has used embroidery very effectively. The hive, itself, has been defined by embroidery. The bees wings are separated by embroidery, the leaf veins and the bee feet are all defined by embroidery. We will be learning how to easily add embroidery to our projects. The beginner's class will watch a demo, the intermediate class will actually do it. You can ensure that you learn this technique by contacting the appropriate individual in your guild and signing up for the class that is being offered to your guild. 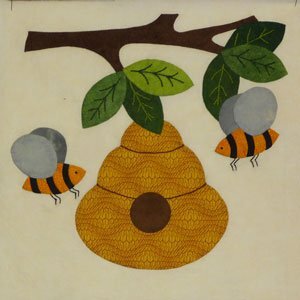 The bee block is in "Jennifer's Hillside". The photo to the right shows a few blocks in that quilt. Come to my trunk show and see the full quilt top. It is a queen size quilt. "Jennifer's Hillside" was named for a cousin of mine. 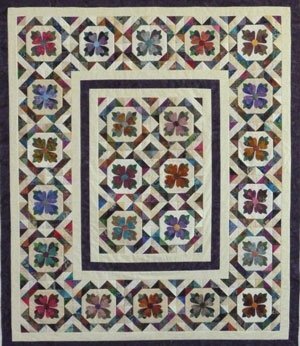 Another quilt that you will be seeing is "Marlene's Mosaic". 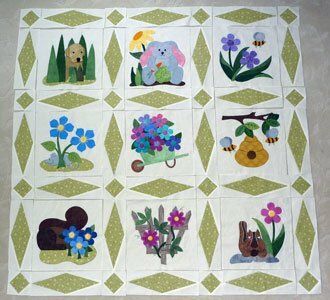 It is a throw size quilt named for a good friend of mine who lives in Arizona. Appliquer's Knot: Click here to learn the appliquer's knot.